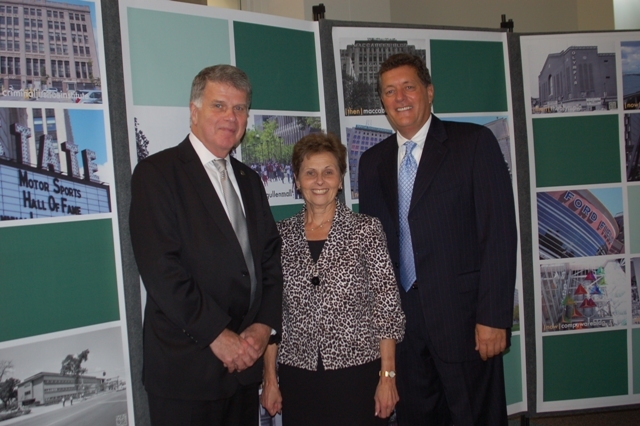 On September 22, SLIS proudly celebrated 50 years of Archival Administration education at WSU with a visit from the Archivist of the United States, David Ferriero. SLIS faculty, staff, students, alumni and archival professionals from across metro Detroit gathered to hear urbane and entertaining remarks of Ferriero which emphasized the importance of archives in American democracy. Noting Thomas Jefferson’s words, “Information is the lifeblood of democracy,” Ferriero described the mission and collection of the National Archives and Records Administration and also shared some of its challenges as he leads it further into the electronic age. Ferriero commended Dr. Phil Mason, professor emeritus and founder of the Archival Administration program at WSU and congratulated Wayne State for rigorously preparing students for professional archival positions. He noted some illustrious WSU alumni who graduated under Mason, such as Frank Boles, Director of Central Michigan University’s Clarke Historical Library and past SAA President and Diane Vogt-O’Connor, Chief of the Conservation Division of the Library of Congress, in addition to the majority of the current staff at the Reuther Library. SLIS and the entire WSU community were honored to have such an esteemed guest speaker, as both reminder and recognition of the vital role our educational programs play in the civic life of our nation.